I recently discussed what it would take to prove that global warming is actually occurring, that it is caused by humans, and that it will be catastrophic. But that’s not the full picture. To understand why so many of us are so skeptical about global warming, you have to understand the environmentalists’ larger track record: a long series of failed predictions and bogus prognostications of doom. It has been 45 years now since the first Earth Day. You would think that in this time frame, given the urgency with which we were told we had to confront the supposed threats to the environment—Harvard biologist George Wald told us, “Civilization will end within 15 or 30 years unless immediate action is taken”—at least one of the big environmental disasters should have come to fruition. Fifteen years ago, an article in Reason took a look at claims like this from the first Earth Day in 1970. The specific quotations have been helpfully excerpted here and have been bounced around a lot on the Internet and on conservative talk radio for the last few days. It is a comical litany of forecasting gone wrong. The author of that old Reason article, by the way, was Ronald Bailey, who has since turned alarmist, in the style of Invasion of the Body Snatchers, and who is the one asking what it would take for us to accept the reality of global warming. He should remember what he reported back then and recall how thoroughly and irrevocably the environmentalists burned up their scientific credibility. As a refresher, here’s a look at seven big environmentalist predictions that failed. A list like this has to start with the “climate change” catastrophe the environmentalists were all warning about in the 1970s: global cooling and a descent into a new ice age. Personally, I’m on record predicting another ice age—sometime in the next 10,000 years or so—based on the geological record, which indicates that the Earth goes through natural glacial and interglacial cycles. We’re in a warm period now, which is very good for us, but we can expect this will eventually change and Canada (if it still exists) will someday be in danger of being scraped off the Earth by the advancing ice sheets. But the claim in the 1970s was different. We were causing the ice age and bringing the glaciers down on our own heads. Deforestation was going to increase the reflectivity of the Earth’s surface, causing light from the sun to bounce back into space without heating the Earth. Meanwhile, emissions of “particulates,” i.e., smoke from industrial smokestacks, was going to block out the light before it even got here. No, really: Life Magazine in 1970 reported that “by 1985 air pollution will have reduced the amount of sunlight reaching earth by one half.” That’s funny, I recall the mid-1980s, and the future was so bright, we had to wear shades. As late as 1980, Carl Sagan was still presenting global cooling as one of two possible doomsday scenarios we could choose from. When global temperatures began to rise, the alarmists switched to the other scenario. The one thing they didn’t change was the assumption that industrial civilization must somehow be destroying the whole planet. When environmentalists said that we were destroying the Earth, they meant it directly and literally. The biggest problem was the very existence of humans, the fact that there were just too darned many of us. We were going to keep growing unchecked, and we were going to swarm the surface of the Earth like locusts, destroying everything in our path until we eventually used it all up. There were going to be an inconceivable seven billion people on Earth by the year 2000, and there was just no way we could support them all. First of all, present trends did not continue (and that’s a trend that will continue). So it took us a bit longer, until 2012, to reach a global population of seven billion—who are better off than the population of Earth has ever been. Wendell Cox at New Geography has thoroughly laid out the trend, which he describes as “fast population growth and faster economic growth,” and sums it up in this graph. Basically, starting from 1820, the early years of the Industrial Revolution, what we see is the growth of production and wealth far outstripping the growth of population, over a period of two centuries. So yeah, it’s a disaster. Clearly. It’s quite possible that the demographic implosion won’t come or won’t be as bad as feared. We’ve seen a lot of cases so far where current trends do not continue. 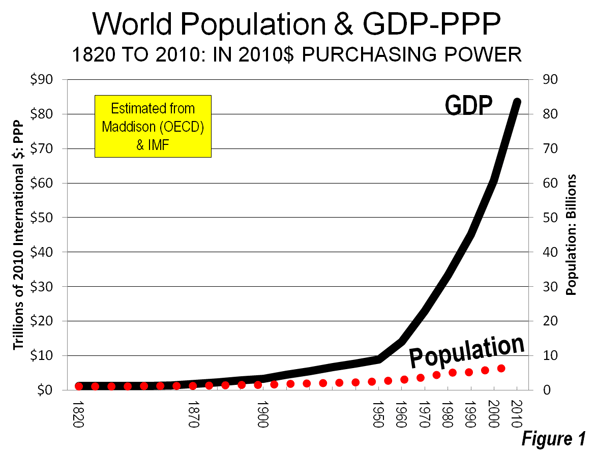 But it is important to grasp the actual consequences of the failed predictions about “overpopulation.” Countries that took these claims seriously, and especially those who enforced population control at the point of a gun, like China, are going to suffer real consequences from listening to the failed theories of Western alarmists. Predictions of global famine were part of the population growth hysteria, but they were such a big part that they deserve their own separate treatment. My favorite failed prediction is this one, from Peter Gunter, a professor at North Texas State University, in a 1970 issue of The Living Wilderness. Demographers agree almost unanimously on the following grim timetable: by 1975 widespread famines will begin in India; these will spread by 1990 to include all of India, Pakistan, China and the Near East, Africa. By the year 2000, or conceivably sooner, South and Central America will exist under famine conditions…. By the year 2000, thirty years from now, the entire world, with the exception of Western Europe, North America, and Australia, will be in famine. I love the part about how “demographers agree almost unanimously.” Sound familiar? I don’t know whether that was really true in 1970, but if they did, they were almost unanimously wrong. Let’s just take India, where the famines were supposed to start. In 2013, India became the world’s “seventh-largest exporter of agricultural products.” China is prosperous and relatively well-fed—much better than under Mao’s disastrous experiments. Most Latin American countries, which were supposed to be starving fifteen years ago, are also net exporters of grain, fruit, meat, and so on. Meanwhile, here are the real world’s “small increases” in food supplies. In addition to running out of food, we were also supposed to run out of natural resources, such as nickel and copper, and above all we were running out of oil. The quaintest thing about this quote, of course, is that he thought there would still be “full-service” gas stations where a guy was standing there ready to pump your gas. None of these predictions came true. The economist Julian Simon famously made a bet with Paul Ehrlich about whether the prices of five key metals. “nickel, copper, chromium, tin, and tungsten,” would decline over the next ten years, as Simon predicted, or whether prices would rise as supplies ran out, according to Ehrlich’s theory. Ehrlich lost the bet, badly, and would do so over practically any long time period. 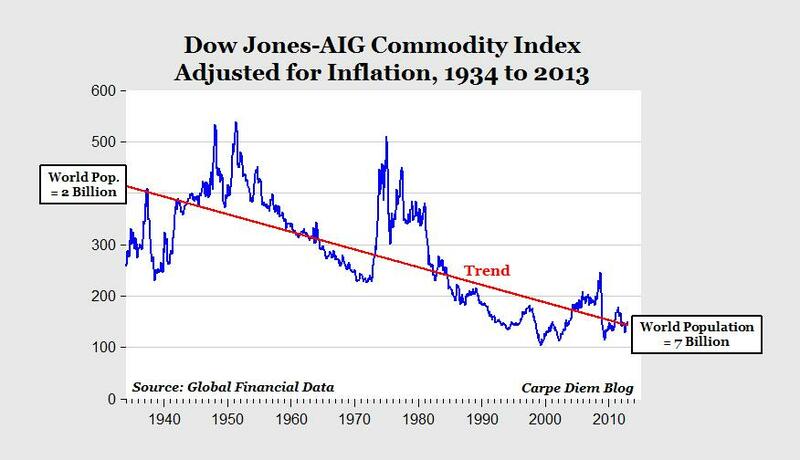 Mark Perry provides a graph of the long-term trend, showing how a commodities index that reflects the prices of things like oil, metals, and cattle declined by more than half as the global population increased from 2 billion to 7 billion. The ultimate example of this trend is the spectacular death of peak oil, the theory that we would eventually reach a peak in global oil production, after which we would be doomed to make do with an ever-dwindling supply. It’s a theory that has been shattered by the fracking revolution, which revived US oil supplies after decades of decline and promises to do so across the world. The cause was a series of innovations in drilling and extraction that made it possible to access huge new reserves of oil in shale formations, where it could not be tapped before. And that was the whole point behind Julian Simon’s bet. His theory was that the human mind is the “ultimate resource,” and that a rising population simply means more brains that are able to solve more problems. Which is a prediction that has worked out better than any of the theories thrown out by the environmentalists. To put that in perspective, a 75% to 80% mass extinction is on the level of the cataclysm that killed the dinosaurs 66 million years ago—caused by the “environmental” catastrophe of a six-mile-wide meteor crashing into the Earth and cloaking it in an enormous cloud of ash and dust. Obviously, nothing remotely like that happened between 1970 and 1995. Many now assume that we are in the midst of a human-caused “Sixth Mass Extinction” to rival the one that killed off the dinosaurs 66 million years ago. But we’re not. The five historic mass extinctions eliminated 70 per cent or more of all species in a relatively short time. That is not going on now. He points out that breathless statistics about the number of species being lost is largely driven by the extinction of already rare species that evolved in isolation and in small numbers on oceanic islands, and which did not survive the contact with the outside world and invasive species. The island conservationist Josh Donlan estimates that islands, which are just 3 per cent of the Earth’s surface, have been the site of 95 per cent of all bird extinctions since 1600, 90 per cent of reptile extinctions, and 60 per cent of mammal extinctions. Those are horrifying numbers, but the losses are extremely local. They have no effect on the biodiversity and ecological health of the continents and oceans that make up 97 per cent of the Earth. Moreover, much of this extinction has already occurred, since most of the world’s islands have already been explored and settled. I suppose you can think of these as casualties of globalization, to be balanced against the many benefits of globalization. But they are not a threat to life on earth more broadly. It’s another reminder that statistics don’t always mean what they seem to mean, and that present trends do not always continue. But all of the alternatives we were promised fall into two categories. There are those that are still too unreliable and expensive; Germany is about to be crushed by the massive cost of its renewable energy boondoggle. And then there are those which have gone from being the alternative championed by environmentalists to being the targets of the environmentalist anger. This is by far the most common trajectory. I am even old enough to vaguely remember the era when nuclear energy—that bête noire of the greens—was touted as an alternative to fossil fuels. Or when hydroelectric dams were celebrated as an emissions-free, radiation-free, feel-good source of electricity, rather than a fish-killer and impediment to the free flow of wild rivers. Or when wind farms were the future of energy, before they were denounced as bird-killers and a blight on the landscape. Now, even large-scale solar energy is under attack. And I’m still waiting for environmentalists to figure out exactly what goes in to those solar panels. Overall, it’s been 45 years since the first Earth Day and the alternatives to the energy sources they oppose now generate about 12% of the nation’s electricity—and then only with massive subsidies, mandates, and tax breaks. And all of this to deal with a problem that doesn’t even exist. Which brings us back to global warming. I noted last week that after a multi-decade plateau in global temperatures, they are now at or below the low end of the range for all of the computer models that predicted global warming. If we go full circle, back to the failed prediction of global cooling, we can see the wider trend. After two or three decades of cooling temperatures, from the 1940s to 1970, environmentalists project a cooling trend—only to have the climate change on them. After a few decades of warmer temperatures, from the 1970s to the late 1990s, they all jumped onto the bandwagon of projecting a continued warming trend—and the darned climate changed again, staying roughly flat since about 1998. No wonder all of these environmental hysterias seem to begin with the phrase, “if current trends continue.” But current trends don’t continue. Global temperatures go down, then up, then stay flat. Population growth tapers off, while agricultural yields increase at even higher rates. We don’t just sit around using up our currently available oil reserves; we go out and find new reserves of oil and new ways to extract it. And that’s the real issue. The environmental doomsayers don’t just extrapolate blindly from current trends. They extrapolate only from the trends that fit their apocalyptic vision while ignoring trends that don’t fit. They project forward the current rate at which we’re using up our resources, but ignore the history of our ability to innovate and create. They get all excited by 20 years of rising temperature or rising oil prices—but ignore two centuries of rising wealth and longevity. It’s almost as if they started with a preconceived conclusion and cast about for evidence to support it. These are only the highlights. I’ve left out some relatively minor claims, like the idea that we’re going to run out of room in landfills to put all of our trash. (It’s a claim I haven’t heard in a while, perhaps because it’s ridiculous and based on total mathematical ignorance about the sheer size of the surface area of the Earth.) I’ve left out a few claims that have faded from public consciousness. Such as “acid rain” (no, it wasn’t a song by Prince), deforestation, or the general hysteria about how “chemicals” were going to give us all cancer. And I’ve also left out a few of the more controversial claims like the ozone hole or the supposedly destructive effects of DDT. Because it was successfully banned, we can’t point to evidence of the actual long-term effect of using DDT—even if we can point to the millions of lives it once saved in the battle against malaria, and the millions of lives it didn’t save after it was discontinued. But by now you can get an idea for the major outlines of an environmental hysteria. The steps are: a) start with assumption that man is “ravaging the Earth,” b) latch onto an unproven scientific hypothesis that fits this preconception, c) extrapolate wildly from half-formed theories and short-term trends to predict a future apocalypse, d) pressure a bunch of people with “Ph.D.” after their names to endorse it so you can say it’s a consensus of experts, e) get the press to broadcast it with even less nuance and get a bunch of Hollywood celebrities who failed Freshman biology to adopt it as their pet cause, then finally f) quietly drop the whole thing when it doesn’t pan out—and move on with undiminished enthusiasm to the next environmental doomsday scenario. When men fail as entirely as they have—well, I’m not going to ask them to fall on their swords. But we might ask them to understand why, when they assure us their newest doomsday predictions are really, really true this time, we’re not inclined to believe a single word they say.